Shot in the head at the burning of the Custom House, Charlie had started his Revolutionary career at the tender age of 10 and suffered other wounds before and after the Custom House but remarkably won GAA Championship medals and lived to 83. Charles Eugene MacMahon was born in Ballina, Co Mayo on 3 August 1904. His father Felix was a Timber Merchant & Builder from Co Tyrone and his mother Nellie (Boyle) a Donegal woman. Charlie had 5 sisters and 1 brother. The family moved to Dublin around 1912/13. In his pension application Charlie says he was at the Howth arms landing with Na Fianna and at Easter 1916 spent 3 days in the GPO, doing despatch and food deliveries to the Manure Works and Amiens St Station. Reassuringly, he adds that as an 11-year old he went home each night! Because of his extreme youth, he was ordered home finally on the Wednesday. In late 1918 he joined B Coy, 2nd Batt of the Volunteers and initially did intelligence work including hold-ups of despatch riders and commandeering cars from hostile loyalists. He also worked with his father in the building & joinery trade. MacMahon took part in the attempted ambush on a troop train at Killester and on Auxies at Ballybough in early 1921. After the ambush at The Thatch, Whitehall he suffered severe injury to his ‘man-bits’ as well as badly torn hands from slipping and falling from a high gate covered in barbed wire. He was in the April attack on the Auxy base at North Wall Hotel and shortly before the Custom House operation was involved in an armed hold up at the British Oil Co depot in Sheriff St to get fuel for the Burning. On 25 May, after being shot, he was captured and taken to King George V (now St Bricin’s) Military Hospital where surgeons fitted a metal plate in his skull. There are references on his pension file to both escape and release from that hospital, but it is not clear how or when he left there. In any event, MacMahon suffered epileptic fits and partial deafness from his head wound – the bullet was lodged at the back of his brain – and was unable to do his former work. Nevertheless he joined the new National Army on 27 February 1922. He was in the assault force at the Four Courts, coming from Winetavern St where he was again wounded by glass splinters in the head, face and hands. Corporal MacMahon stayed in the Army until he was medically discharged (Character & Conduct Very Good) on 3 January 1924. Suffering increasing agonies from his head wound, Charlie attended a succession of doctors and surgeons. Their advice was against attempting surgery which would likely result in him left “an imbecile” (as the term of the time put it). His parents were very closely involved in supporting him, financially and otherwise as he readily acknowledged. Eventually, top surgeon Sir William de Courcy Wheeler at Mercers Hospital operated and successfully removed the bullet on 10 Dec 1925. He was able to resume work as a Quantity Surveyor and in 1937 he married Roise MacMullan. They had 3 sons & 3 daughters and lived in Malahide, Finglas and finally Raheny for many years. Finally, like many others in the IRA, Charlie was a serious GAA man. He was a leading player in his day in both codes – football with St Lawrence O’Tooles and hurling for Kevin’s, Young Ireland and Dublin. Kevin’s club history (http://kevins.ie/default.aspx?ctrl=custom&content=18 ) refers to him as a legendary hurler. He captained the Dub hurlers in 1932 & 1934 when they lost the Leinster & All-Ireland finals. 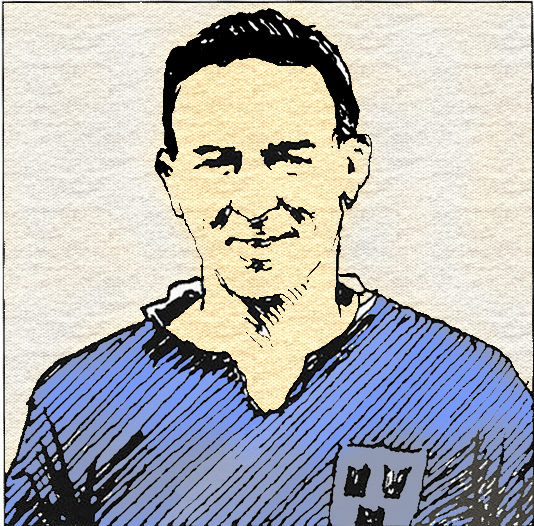 But Charlie did win the All-Ireland in 1938 (v Waterford), four Leinster titles & two League titles in 1929 & 1939. Some recovery and sporting record for a man who’d carried a bullet in his brain for nearly 5 years! Charles MacMahon lost his sight in the 1980’s and he died on 5 December 1987. He was buried in Fingal Cemetery (on the opposite side of the road to Balgriffin Cemetery) in north co Dublin. 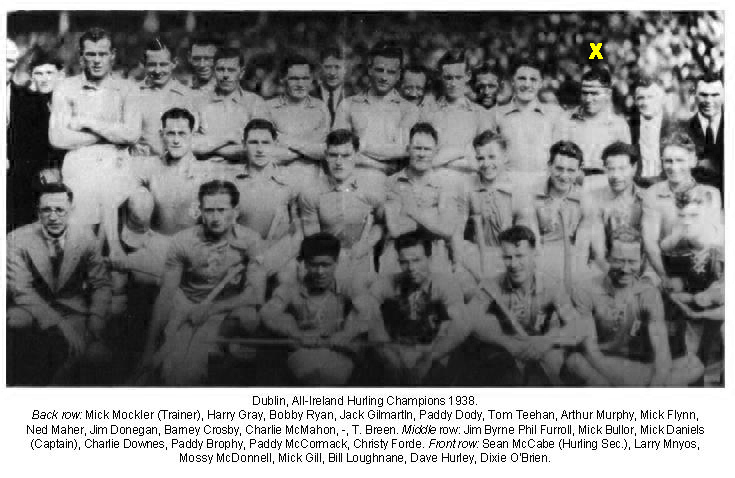 In the 1939 photograph that includes Sean Ward, would I be correct in saying that in the front row are Paddy O’Daly, Tom Ennis, Oscar Traylor and ? Henderson. It is probably a reunion of the 2nd. Battalion. Correct Vincent, pic is from Dublin Brigade Review 1939. The Henderson in front row is Frank; and the two men on extreme left are Capts. T. Sleator & Michael William O’Reilly. Interesting that Oscar Traynor sat between his Civil War foes Tom Ennis (with whom he apparently fell out over the Custom House op even before the split) & Paddy O’Daly.